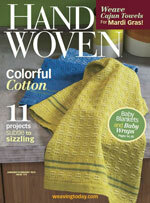 Weave beautiful yellow towels as seen in Handwoven Jan/Feb 2015! This pattern takes Atwater-Bronson lace and turns it to create a decorative windowpane check. With this kit, you'll get to create beautiful pure delight towels in yellow. This kit contains Handwoven Jan/Feb 2015, and a Eugene Textile Pure Delight Towels Yellows Color Kit, which has a 4 colors. Handwoven January/February 2015 explores colorful cotton. You'll get 11 projects to try, from table mats, to blankets, to towels, and more!